GET ready for a party as the nation’s favourite variety show as That’ll Be The Day returns to St David’s Hall for its 30th anniversary extravaganza! Celebrating the solid gold hits of the 50s, 60s and 70s combined with hilarious comedy, this special night is not to be missed. If you love nostalgia then this is the show for you as the clocks get wound back to an unforgettable era that changed the course of music history and youth culture forever. Relive all the classics from Mick Jagger and the Rolling Stones, plus Petula Clark and many more! 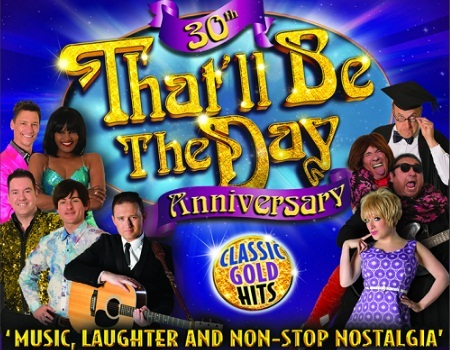 That’ll Be The Day was first created by Trevor Payne in 1987 and quickly established its reputation on the cabaret circuit. By the early 90s the production was playing regional theatres across the UK. Ever since the show has delighted the masses with as many as 230 shows a year to capacity crowds. Even after all these years, Trevor continues to direct, produce and star in the show today. Celebrate the 30th anniversary of That’ll Be The Day at St David’s Hall and support the Make-A-Wish Foundation’s fantastic work. Tickets are still available priced £21, £23.50 and £25 (plus a £3.95 Ticket Service Charge per transaction and an optional 95p postage fee). Reductions of £1 off each ticket for standard concessions. Groups of 10 or more are entitled to £1 off each ticket.